The ‘Pink City’ of Rajasthan or Jaipur is a major tourist destination of the country, which have grand Rajput palaces, forts, cultural ethnicity, princely ambience and amazing colorful markets, scattered everywhere around. In Jaipur, one can see a very beautiful and lively picture of the Pink city showing its hospitality which provides one a comfortable vacation as well.The Pink color makes the city look more beautiful and it let the people attracts towards to the perfect combination of the city with color and its traditional beauty. Jaipur embraces a royal past drenched completely in extravagance. The city possesses many lavish palaces including several legends, enchanting travelers and localities as well. The city is well known for its monuments, palaces, forts, temples and gardens. All these places are the bookmarks of the erstwhile traditional era, where royalty was once lived with complete power. stones which looks eye catching. The products are carved out by the sculptures or craftsmen by various hand tools or machines. Superior quality marbles are used to make these products which are free from stains, cracks and chips. Pillars are carved out of marble stone which are highly durable and resistant to seasons. Intricate and beautiful designs are carved out on these pillars. Marbles can also be used for table stands, as this is a hard and durable stone. Because of its fine and superior surface finish it is used in decorations also. The white marble is highly in demand. The fountain in the middle of the gardens or halls in which the water cascades down looks very beautiful if it is made from marble. These have traditional and beautiful designs and are carved out by hand tools. Marble is also used for making benches which are used in lawns, gardens, parks, restaurants etc. of Jaipur. 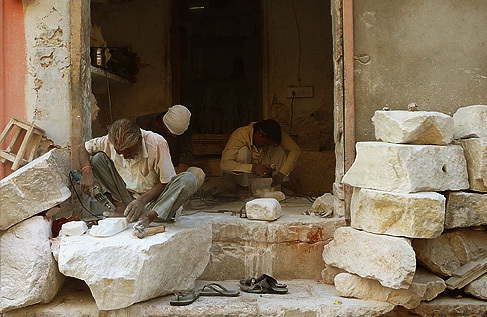 The marble of Jaipur is in high demand since past few decades. Table tops are also available which are made up of marble. These are carved out from the world famous Makrana white marbles. These marble table tops can be used in resorts, offices, hotel as well as homes for decorative purpose. Colorful designs are carved out on these table tops to make them more beautiful and these are available in Jaipur at nominal prices. These are available in many shapes including round and rectangle. Birla Temple of Jaipur is also known as Laxmi Narayan Mandir. It is made up of white marble stones. The statues in this temple are carved out of single marble stone. It is decorated with floral motifs. All types of moortis, human statues, artistic statues and temples are also built by using marbles. Many temples and moortis are sculptured and completed in Jaipur and nearby areas in other cities of Rajasthan in which marble work is used. Moorti India is the leading producer and exporter of marble statues of all Indian Gods and Goddess. Moortis of Jain, Hindus, Sikh, Vaisnav, Jesus sculpture, handicrafts and garden statues, religious places are made by Moorti India. In some forts and palaces of Jaipur also, marble work is used to a great extent. White marble is used for floor coverings and nowadays it has become fashion to have the marble floorings in homes, offices, hotels, resorts, temples etc. Many decorative and gift items made up of marble are also available in the market today. These are in high demand as they are strong and durable. The finishing of marble product is smooth and it does not require polishing.